Learning Less than and Greater Than Signs Can Be Fun with our Alligator Video. Greater than and less than is a neat concept to teach with the alligator or crocodile mouth. Students can also have an art activity prior to the lesson to create alligator sock puppets. These puppets can be utilized in the lesson to help students choose the larger number. This type of attention to the small details make it more enjoyable and will help the students focus. 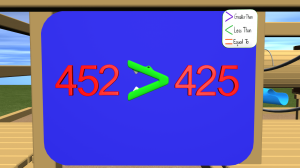 It requires a great amount of focus for a young mind to look for the difference between 452 and 425. Utilizing visuals and sock puppets is a great way to heighten that focus. Come check out our videos and if you are not sure try the free trial! Enjoy learning with us.